This green beans and rice recipe is a one dish meal. Green beans are also known as string beans or french beans. Quick and easy to make,this beans and rice dish is a good to serve at lunch at home or to pack to school or office. It takes less than 30 minutes to make including the chopping of beans. As this beans rice may be served at room temperature, you may make it as a party dish too. 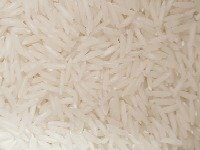 You may use basmati rice or any white rice or brown rice that you normally use to make plain rice. You may cook the basic plain rice in the pressure cooker, in the microwave or on the stove top. You will find the instructions to cook the plain rice here. If you have any leftover plain rice in the fridge, you may use that. How to make green beans rice? List of ingredients and the quantity for green bean rice. Cook rice till just done. It should not be too soft and mushy. Slit green chilies or chop them. Heat a kadai or a fry pan. When oil is hot, add hing, mustard and cumin seeds. When they stop spluttering, add chopped green chilies. Fry for a minute. Add curry leaves and chopped green beans. Cook on low flame for 4-5 minutes or till beans are just cooked. Add the cooled rice, salt and mix well. Cover and cook for two minutes. Add fresh chopped coriander, fresh grated coconut. Take off the flame and add lime juice. Mix well. Pack for lunch or serve when the kids come home from school. The white and green color looks very attractive. Below are the variations you can make with this green beans and rice recipe. Each variation may change the color as well as the final taste of this rice dish. Use fresh tender green French beans. Add cooked rice when green beans are almost cooked. Add 1/2 tsp ginger garlic paste along with curry leaves. Add red chilies instead of green chilies. Add 1/2 tsp each cumin seed and coriander seeds powder. Add 1/2 tsp garam masala. Make a paste of red chilies, fresh coconut and a little poppy seeds ground with a little water. Add the paste when the green beans are half cooked. Stir till the paste thickens and the beans are done and then mix rice. Mango Rice - Serve with rice or roti. khichadi - Easy to digest rice and lentil recipe. 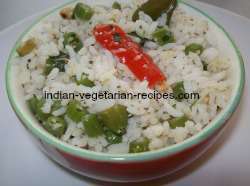 Lime Rice - Lemon Rice - Chitranna - Easy to digest rice and lentil recipe.